This video still image shows the smoke trail created by the meteor that exploded over the Chelyabinsk region of Russia on Feb. 15, 2013. 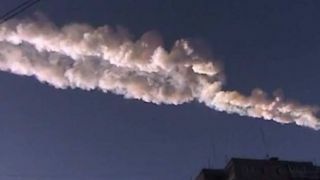 The dramatic meteor explosion over Russia Friday (Feb. 15) highlights the need for more attention to be paid to the threat of near-Earth asteroids, an influential American congressman says. Rep. Dana Rohrabacher (R-Calif.), vice chairman of the House Science, Space and Technology Committee, responded to the Russian fireball by saying the event should serve as a wakeup call. “We have been looking forward to the close pass of asteroid 2012 DA14, which will pass between the Earth’s surface and our communications satellites this afternoon," Rohrabacher said on Friday, referring to the 150-foot-wide (45 meters) space rock that came within just 17,200 miles (27,000 kilometers) of our planet that day. "We have calculated that there is no chance this asteroid will impact the Earth, and that we will get an opportunity for a close-up view as it flies past," he added. "Unfortunately, we didn't see the one that exploded over Russia until it happened." Rohrabacher said that the United States has been spending millions to find and track asteroids and comets, but the object that exploded over Russia was apparently so small "that we aren’t even looking for objects of this size." Astronomers estimate that the Russian meteor was caused by a 50-foot-wide (15 m) object that weighed about 7,000 tons. “What concerns me even more, however, is the fact that we have no plan that can protect the Earth from any comet or asteroid," Rohrabacher said. "So, even if we find one that will hit us, we might not be able to deflect it." Change may be in the offing, however. The House science committee announced today that it will hold a hearing in the coming weeks on how to deal with the threat posed by potentially hazardous asteroids. “This is the only preventable natural disaster, and we have mounting evidence that this a real and tangible danger,” Rohrabacher said. "Our heartfelt prayers go out to all those affected by this [Russian] event, and this shows that we must protect ourselves, and the planet, from this clear danger.